When I heard him, I didn’t really hear him. His words were part of the clatter, like a car horn or someone yelling for a cab. They were, you could say, just noise—the kind of nuisance New Yorkers learn to tune out. So I walked right by him, as if he wasn’t there. My name is Laura Schroff, and An Invisible Thread is the story of my friend, Maurice, and me. We met on 56th street in Manhattan in 1986, when I was a 35-year-old single, successful ad sales executive, and he was an 11-year-old homeless panhandler. He asked me for spare change; I ignored him and kept walking. But something made me stop, and turn around, and go back to him, and that day I took him to lunch at McDonalds. We met the Monday after that, and the following Monday, and every Monday for the next four years, and hundreds of times after that. Today, 25 years later, we are still great friends. An Invisible Thread is one of those books that just tugs at your heart-strings! Get ready for a lot of "feel good" adjectives in this review, I just can't help myself. Laurie and Maurice's true life story truly makes you believe that good things really do happen when you least expect them! I really liked that their story was told honestly and straight forward... warts and all. Life's not always a smooth ride, even when an impossibly wonderful thing happens. I appreciated that the childhoods of both Laurie and Maurice were shared for the reader, I think it allowed you to get a better feeling for the way things were in their lives, as dissimilar as they were, Laurie and Maurice were able to become friends under unusual circumstances. An Invisible Thread is simply written, clear and true. I wasn't sure what to expect, perhaps that it might be too "heavy" or too embellished, but it was so entertaining and a quick read, that I really did hate to see the last page. 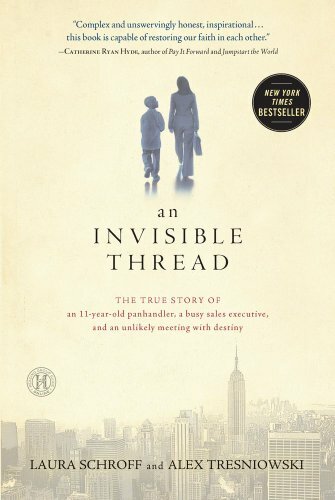 Laurie's thought about her life being "an invisible thread" made me consider the phrase. She made me think. She made me believe that we can connect and that we can change lives for the better, both our own and those whose life paths we cross. I give this one 4 out of 5 stars! *This e-galley was provided to me by the publisher and in no way did that affect my review.